The Armadillo Grill. Sounds like a pretty fun place. Perhaps they serve Armadillo? Well, at one time they did but, the new restaurant location no longer does. Instead, The Armadillo Grill serves up American-Southwestern Fare in the town of Blairsville, GA. The owner/cook used to have an armadillo farm where she raised armadillos and served them in her restaurant. Now, she just displays photos of armadillos all over the restaurant and serves up some amazing food. We arrived at The Armadillo Grill around 6:45pm and found that it was busy but not overly crowded – a good thing considering it was the day after Thanksgiving and we were hungry. The menu featured a number of Mexican entrees along with some American-Southwestern fare. I was up in the air over whether to order a Mexican entrée or one of the American-Southwestern entrees. I decided to order the best of both worlds. 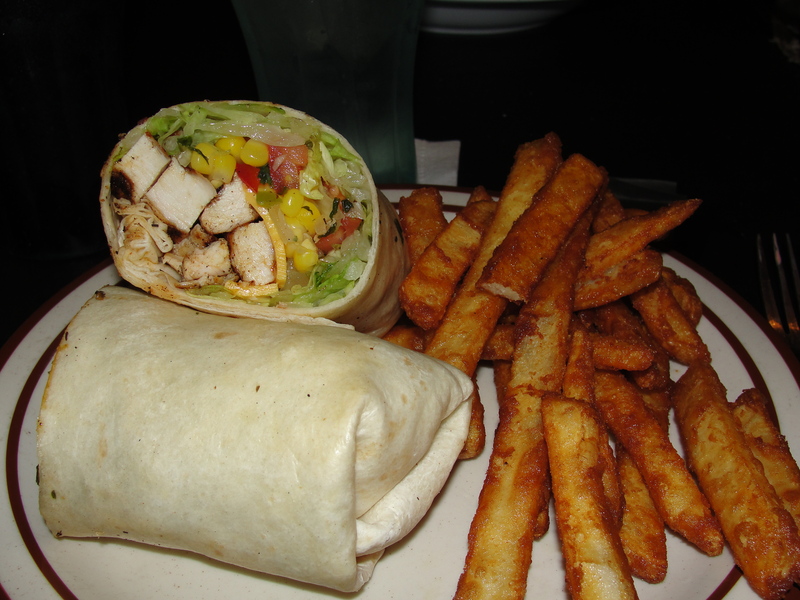 I ordered the Southwestern Chicken in a tortilla with fries. The chef/owner of The Armadillo Grill used to own a restaurant called Comfort Café and they had some of the best fries ever. Guess What? The Armadillo Grill now serves those fries – woo-hoo! The Southwestern Chicken in a tortilla (this was not the real name of the menu item…I just didn’t write it down and don’t recall) consists of grilled chicken, lettuce, corn salsa, shredded cheese and a house sauce. This was served with a good sized serving of fries. The tortilla was huge and packed full of ingredients. The tortilla had a slight flour taste but I really didn’t get any other flavors from it. The chicken was very warm and in large pieces. The chicken had flavors of cumin, chipotle and pepper and was really good. It was moist and had a great consistency. We were only in Blairsville for a shot time but, I would have loved to have visited the Armadillo Grill once again. The tortilla and the fries are just great. Everyone else ordered a variety of items and all loved them just as much. I wish I could find fries that are similar to these somewhere because they are just so darn good. Even though the Armadillo Grill does not serve up Armadillo, they serve up great Southwestern Flare with outstanding fries. The image says that the food was delish! Do drop by my blog sometime, I just did it first ever dessert recipe post and I’d love to know what you think.